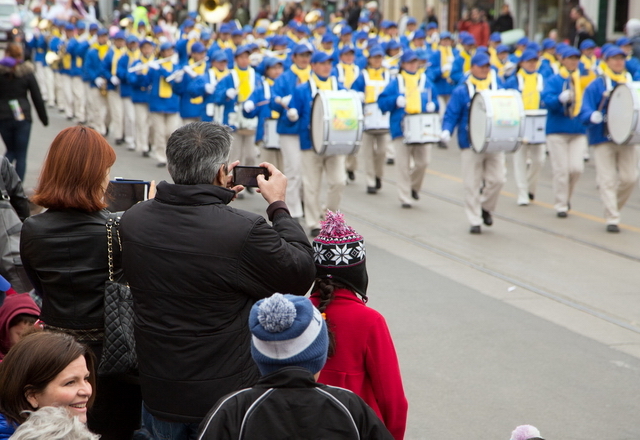 On Easter Sunday, March 31st, 2013, Toronto enjoyed its 47th annual Toronto Beaches Lions Easter Parade, one of the largest Easter celebrations in North America. 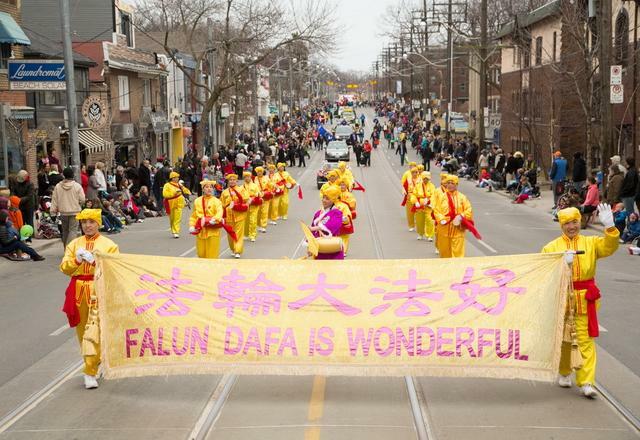 As in previous years, Falun Gong practitioners were a welcome part of this multicultural parade. The parade, sponsored by the Toronto Beaches Lions Club, has been an annual fixture since 1966. The parade route covered a distance of 2.5 kilometres and lasted nearly two hours. Many government departments and community groups participated in the parade. Each year, the colourful processions attracts tens of thousands of spectators. This year, Falun Gong practitioners fielded two exciting musical groups – the Divine Land Marching Band, and a group of traditional waist drummers. The Divine Land Marching Band participated in the parade for the sixth consecutive year. 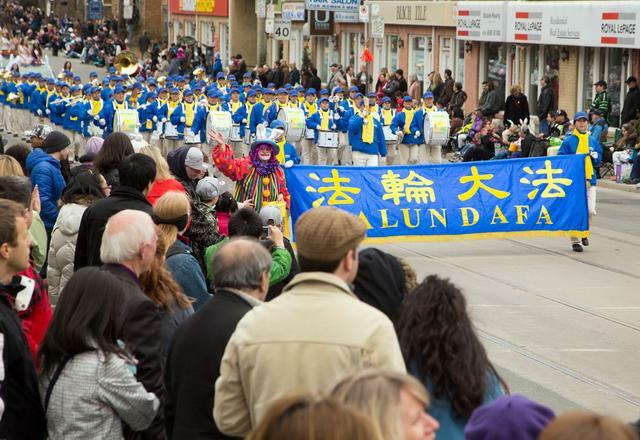 This is the second time for the Falun Gong waist drummers to take part in the Easter Parade. The waist drum group, made up of 20 drummers, was one of the highlights of the day. The drummers' vigorous energy displayed beautiful traditional Chinese cultural elements for the crowds. The Divine Land Marching Band, with more the 80 members, was the largest procession of all. Their bright costumes and magnificent music were greeted with warm cheers and applause from the crowds lining the streets. As they marched past, people captured the memorable moment with their cameras. Mr. Chen is a recent immigrant from mainland China. As a new resident of Toronto, he was very impressed with the multicultural presentations in the parade. He commented that the Divine Land Marching Band was very neatly organised and presented a very bright appearance.